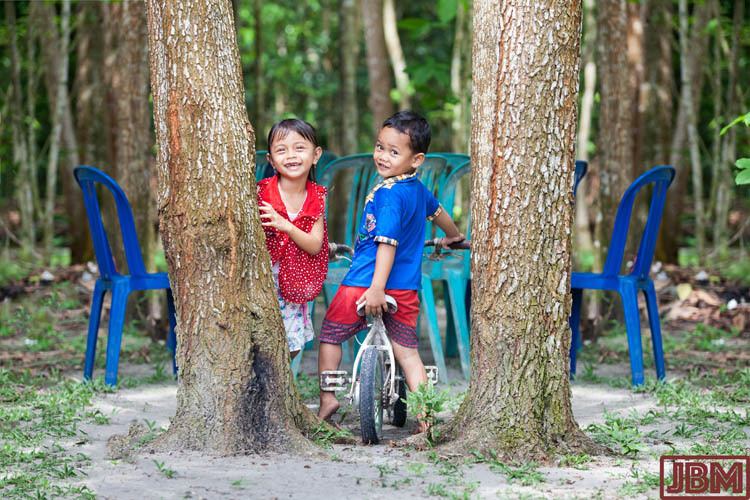 As I approach the end of my time working at the Yayasan Usaha Mulia (YUM – ‘Foundation for Noble Work’) I’d like to share a selection of the photos produced in the course of my work there since September 2014. Over that time I’ve made many thousands of photos over 72 separate ‘shoots’ for YUM Kalimantan – but ‘only’ 2729 (at last count) of these have made it into the archive. My warm, sincere and profound thanks go to YUM for giving me the opportunity to have these experiences, and to capture these images. Commuting, Kalimantan-style. This was one of my first days of work at ‘the office’. We went to check on the conditions of home gardens established in the village of Kanarakan, an hour upriver, and only accessible by boat. As we navigated up the Rungan River in our two little klotok canoes through the thick smoke haze, past watchful orangutans in the trees on the river bank, I knew that this job was going to be… different. 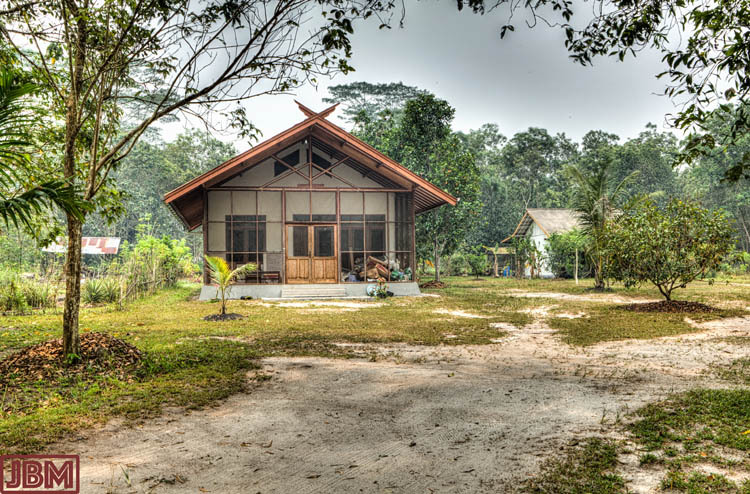 So here’s the ‘office’, RC30 (Rural Centre 30), so-called because it is 30km from the centre of the provincial capital of Palangka Raya It is the centre of operations for the YUM AGRO Project. All the field staff and trainers are based there, but they are out-and-about much of the time, so on any given day I will have between zero and ten workmates there. The site includes ‘model’ organic gardens, chicken hatcheries and coops, a training hall, a modest laboratory, areas for trial of new organic gardening techniques and plant varieties, a seed garden, and ponds for fish farming and production of azolla. 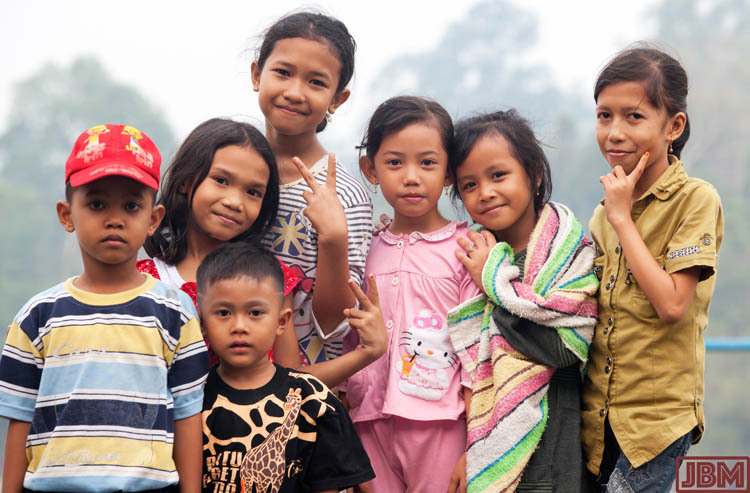 Infrastructure and utilities can be a challenge in Kalimantan. The office is equipped with a generator because of the daily mains power outages, so it usually has electricity. It often has some mobile phone signal, but (sadly) it rarely has internet connectivity. RC30 is a seven kilometre excitement-prone motorbike ride from where we have been living at Rungan Sari (part of Sei Gohong village). This is the seed garden at RC30, where seed-saving techniques are practised and developed. YUM supplies seeds (all non-hybrid, non-GM) to the almost 500 families in the district who now maintain home gardens under the YUM organic model. Seeds are beautiful. Wonderful shapes, textures and colours, and all almost bursting with life potential. 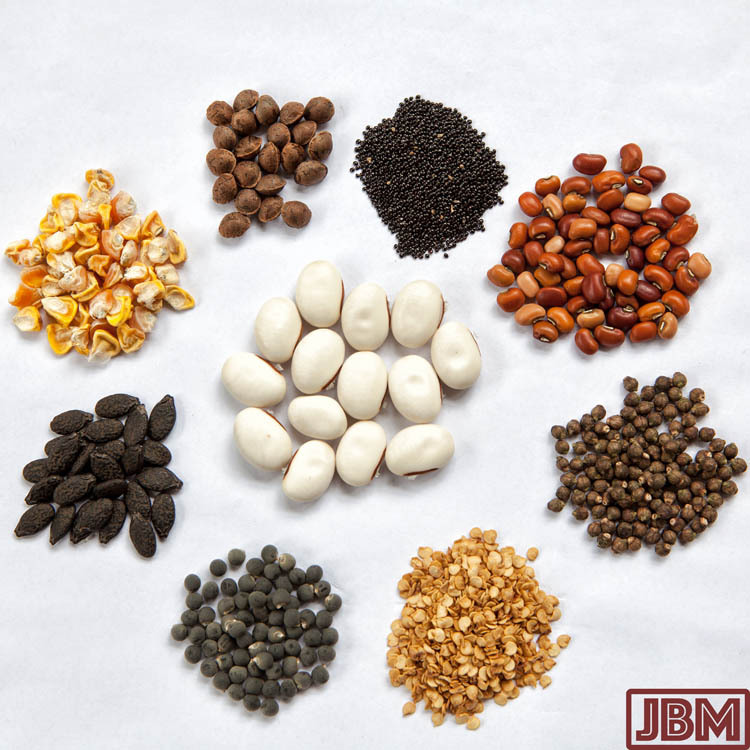 Here are some from the YUM ‘Seed Bank’, including corn, melons, chili, and varieties of bayam and beans. 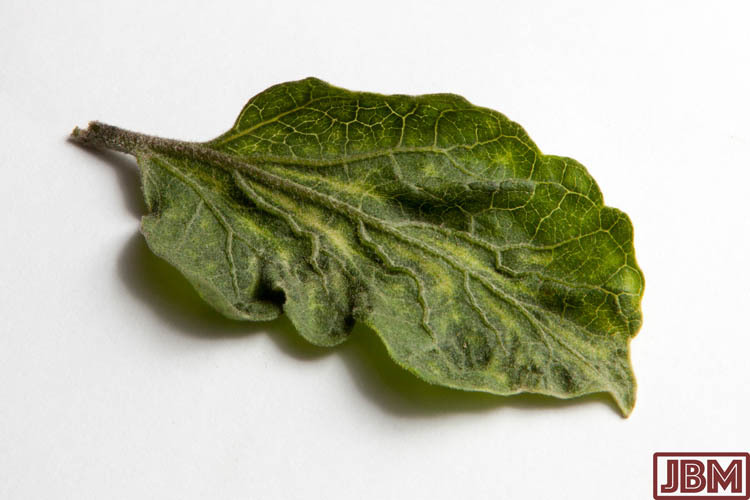 The YUM laboratory at RC30 is used to identify, develop and trial treatments for a variety of plant diseases. 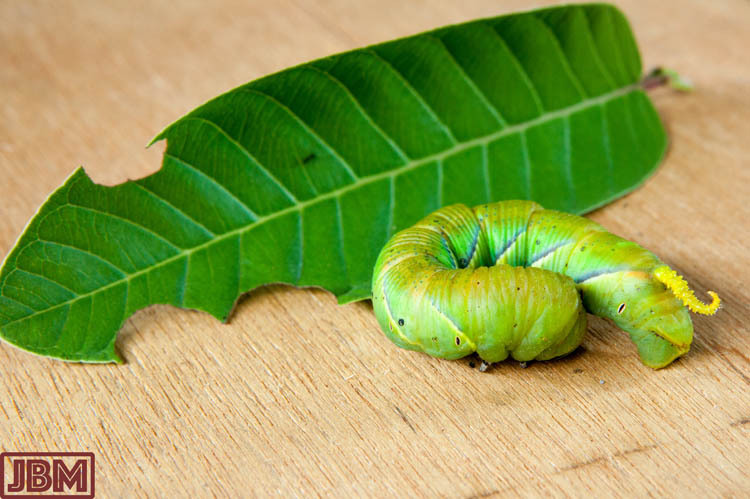 And to develop repellents and non-chemical insecticides. 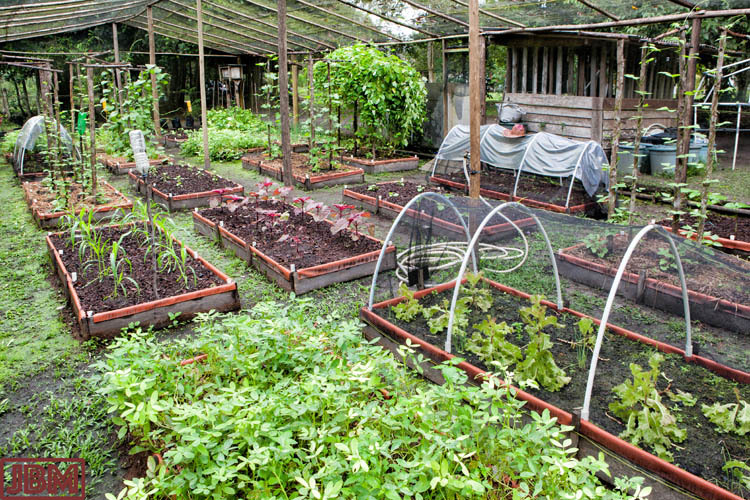 The success and productivity of the YUM-assisted organic home gardens is pretty impressive. 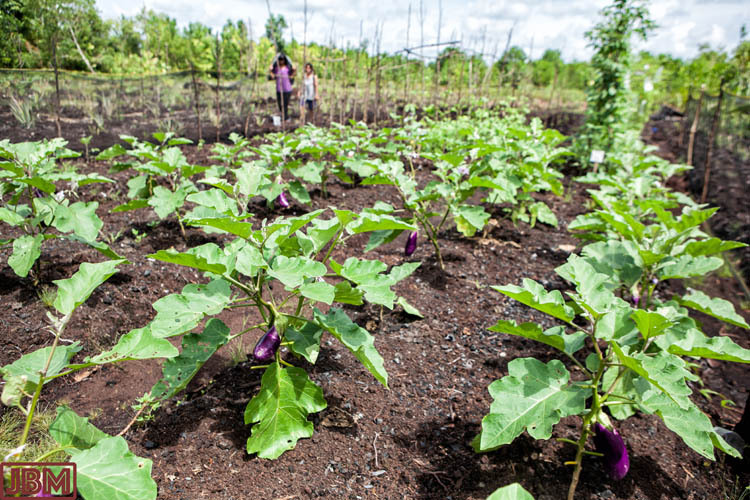 A great deal of effort goes into soil improvement, because the soil in this part of Kalimantan is very poor – mostly consisting of peat or sand. No rich Java-like volcanic soils here! So, under the YUM model, a number of techniques may be used in combination to prepare the soil for vegetable cultivation: compost, bokashi, beneficial fungi (trichoderma and mycorrhiza ), EM4 (effective micoorganisms), worms, biochar, and others. 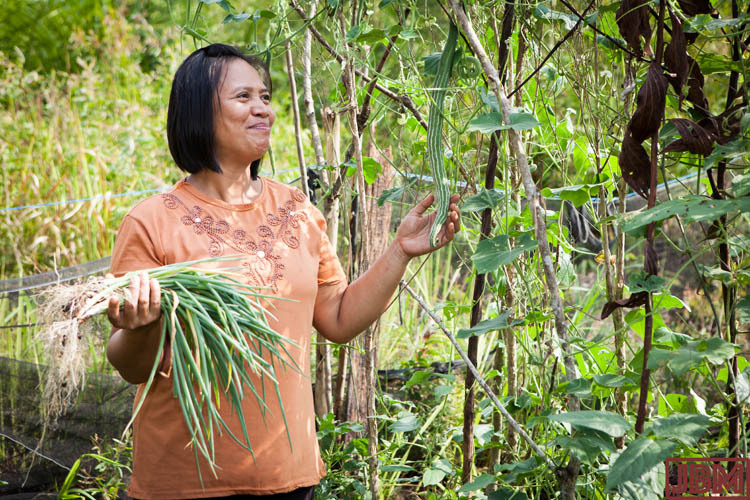 In all seven of the villages in which YUM works, and across all of the communities, (mostly Dayak, Banjar and Javanese), it is always the women who are the most enthusiastic and diligent gardeners. This is probably because they best appreciate the value of having fresh healthy vegetables for the family to consume. 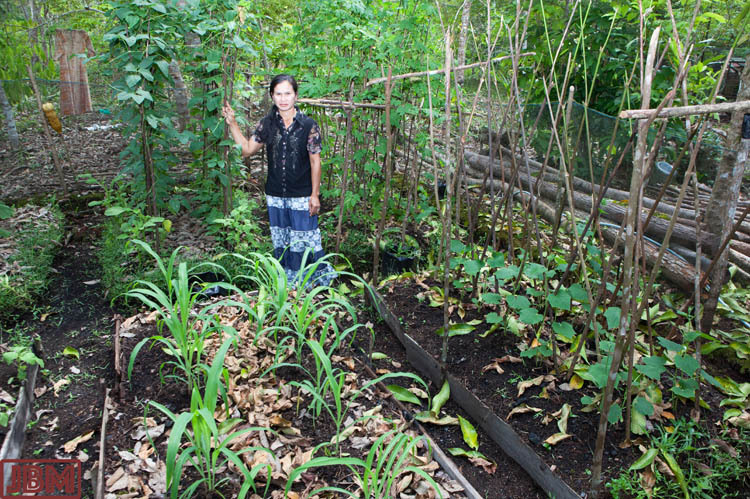 Some of the more successful home gardeners are able to produce more than they need for home consumption, and want to expand into small-scale commercial agriculture. They are establishing larger gardens, and YUM is assisting by providing advice, accountancy training, distribution and marketing services to assist them. 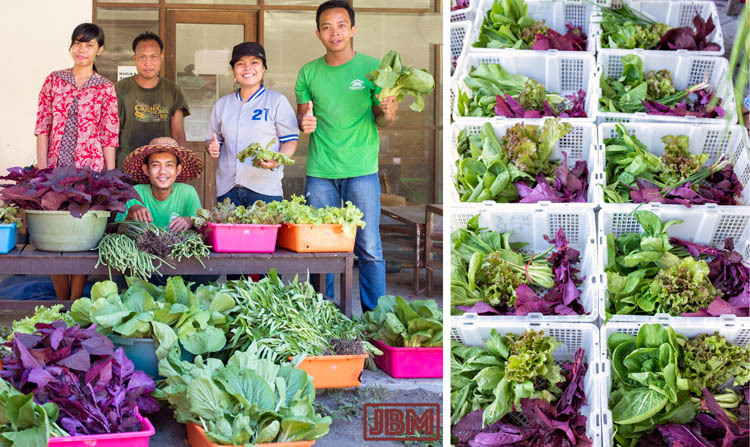 This new project is just taking off now, and a pilot is under way with around 20 households signed up to receive weekly supplies of fresh organic vegetables delivered direct to their homes. Speaking as one of those customer households, we can say that the early results are very promising! 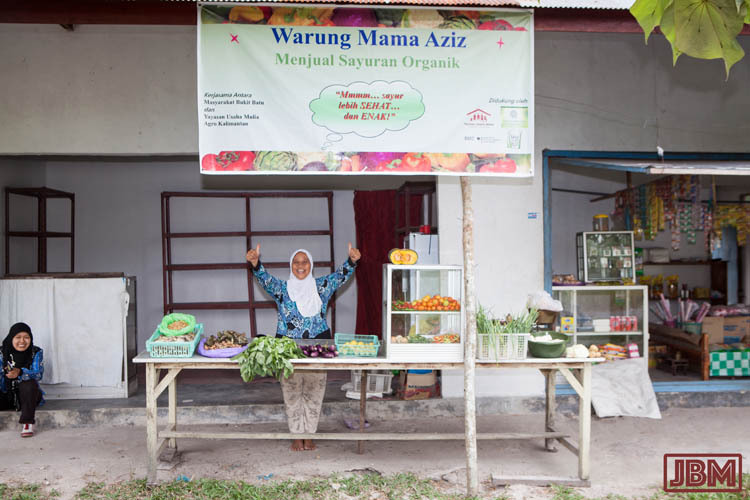 As well as the home delivery service, several warung sales points are in the process of being established for direct sales to the local community. 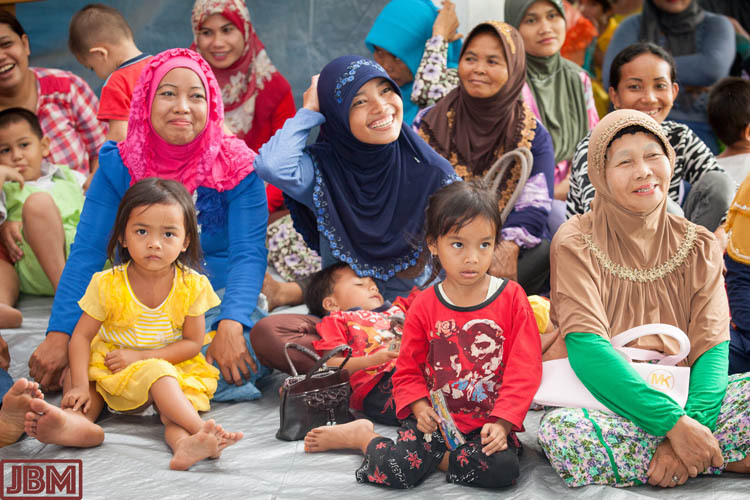 Mama Aziz at Tumbang Tahai village operates the first of these. (The banner above her is a JBM design). A lot of time and effort goes into the development and delivery of comprehensive training for project participants. The training is usually delivered through a series of half-day sessions for newly signed up participants, as well as ‘refresher’ training and advice about new techniques for the ‘experienced gardeners’. They are relaxed and informal affairs, which everyone (trainers and participants) seems to enjoy immensely. 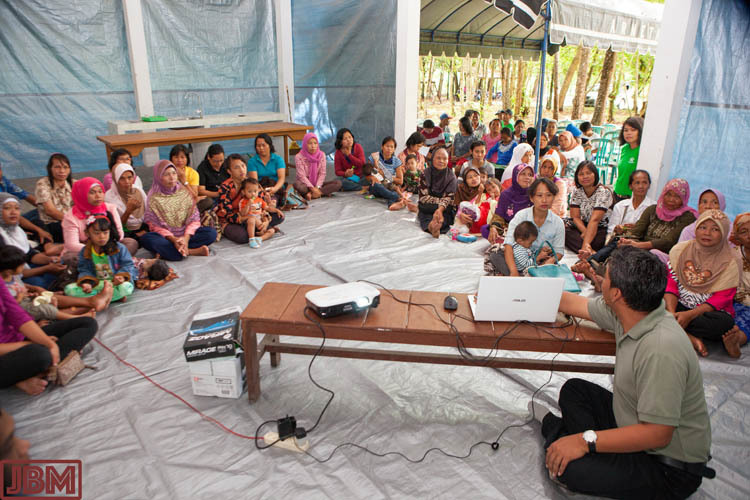 Sometimes there are nearly as many children as adults in attendance at the training sessions! And while the training goes on, the kids (being kids) enjoy playing in the grounds of RC30. 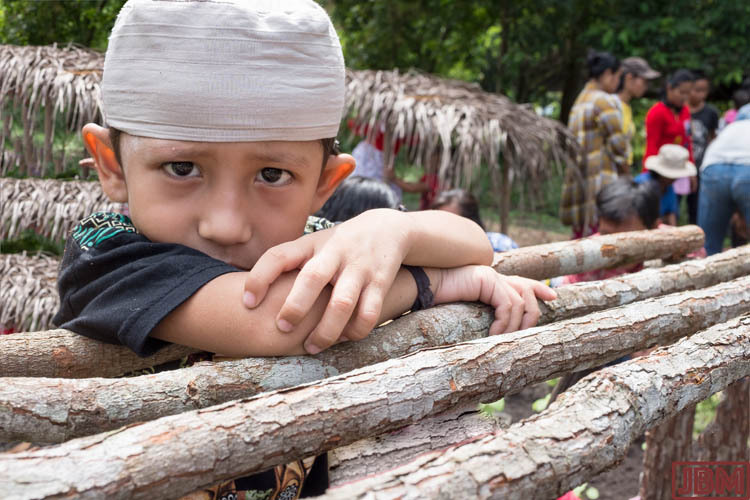 While his mother was learning how to construct new garden beds, this young fellow seemed a little pensive. As well as home gardens for the production of vegetables, a new project has started, at the request of project participants, to develop gardens of medicinal plants, known locally as an Apotik Hidup (literally, a ‘Living Pharmacy’). 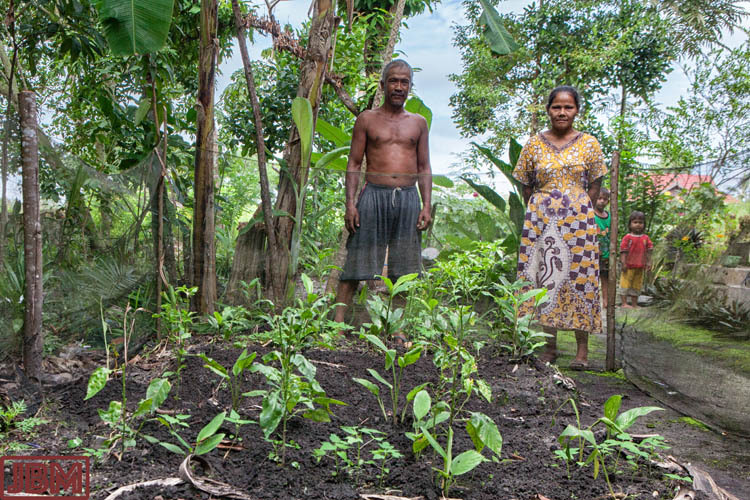 Each garden in the pilot project has been supported by YUM Agro, and supplied with 12 species of medicinal plants. There is a well-developed project for ‘small animal husbandry’. It’s currently about fish farming and chicken production; an attempt was made with goat farming, but the goats (being goats) didn’t behave themselves, and the project didn’t continue after the pilot. 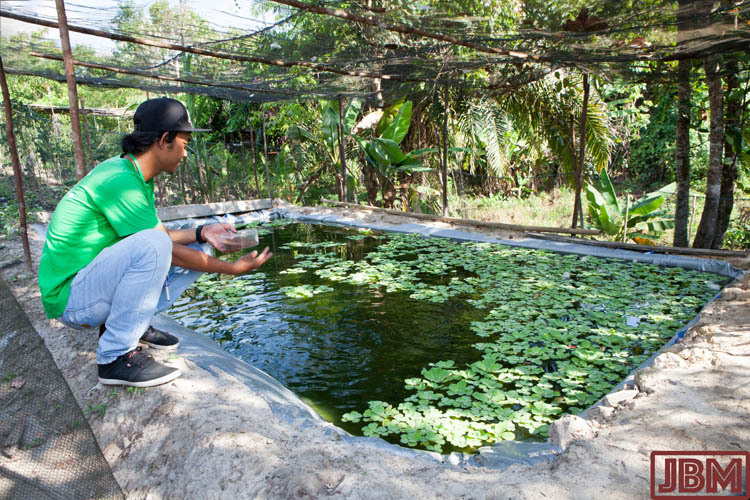 Fish farming is quite common in this region, with fish raised in purpose-built ponds. In part, it’s a sad response to the declining fish population in the massive river systems of Kalimantan, and the mercury contamination (the result of illegal gold mining activities) of those fish that remain alive. The main fish species produced are Ikan Nila (Nile tilapia – Oreochromis niloticus), Ikan Lele (Catfish – Clarias batrachus) and Ikan Patin (Shark Catfish – Pangasius pangasius). 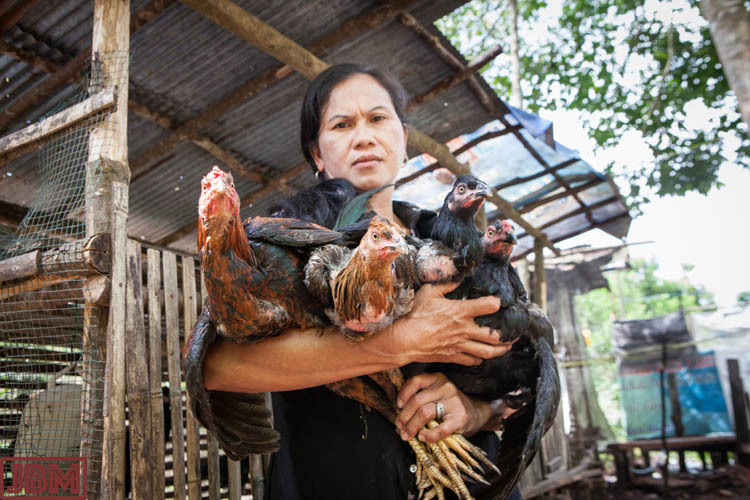 Most of the chickens sold in the markets here are ayam potong – chickens raised en masse in big ‘factory farm’ sheds. 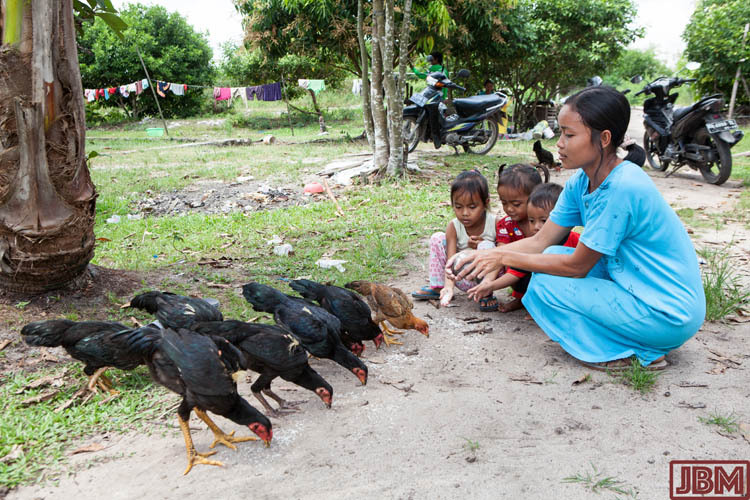 Much more highly regarded are free range village chickens – ayam kampung. They are easy (and kind of fun) to hold in your hands when they are little. They are more of a handful when they grow to full size, but it is still possible! 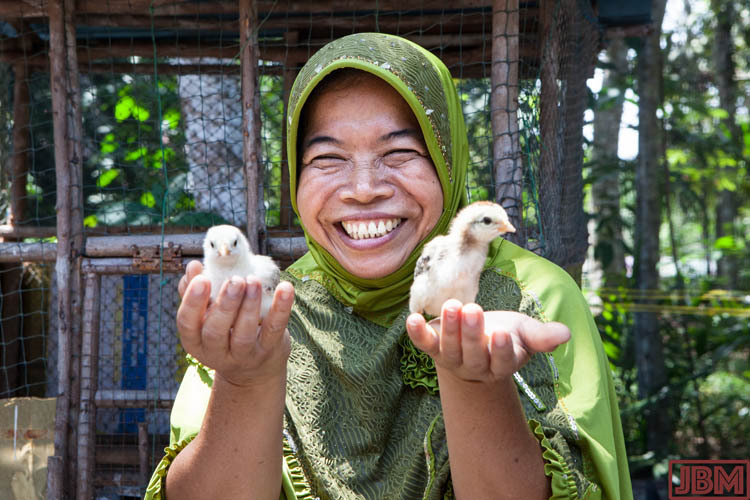 Everyone in the family can help with raising chickens! Azolla is a an aquatic fern with some remarkable properties. In particular, under favourable conditions it can double its biomass within a week, and it is an excellent source of protein. In areas where wet rice cultivation is possible (i.e. not here!) 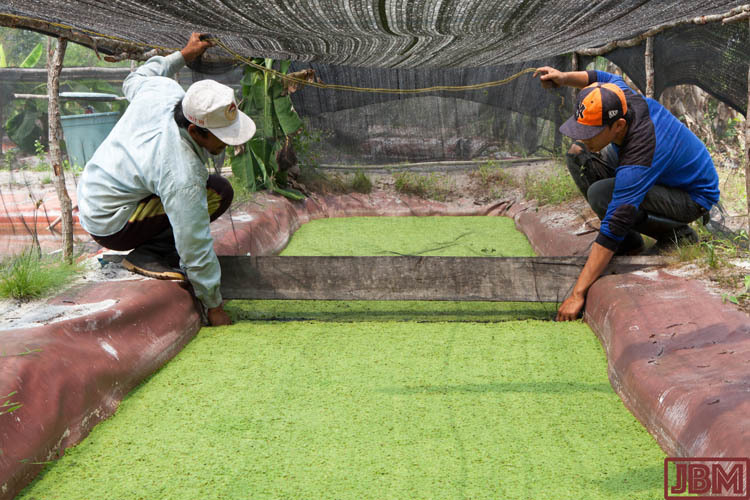 it is often grown as a companion plant to the rice in the flooded paddy because of its nitrogen-fixing properties, YUM has been trialling production of azolla for use as a rich fertiliser, and also as feed for stock. Chickens love it. This entry was posted in Indonesia and tagged Azolla, biochar, bokashi, Bukit Batu, Central Kalimantan, home gardens, Kalimantan Tengah, mycorrhiza, trichoderma, Yayasan Usaha Mulia, YUM. Bookmark the permalink.